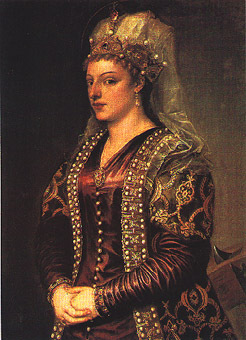 Through her marriage to James II Lusignan of Cyprus in 1468, CATERINA CORNARO of Venice became Queen of Cyprus when she was just 14 years old. The initial wedding ceremony was conducted in Venice with the King represented only by his proxy. The marriage was confirmed by a second ceremony conducted in person in Cyprus four years later. Upon the death of her husband in 1473 (and of their infant son Prince James III Lusignan in August of the same year), Queen Caterina became sole ruler of her island kingdom. What forces propelled a daughter of a republic such as Venice--for whom the Venetian government found it necessary to create the title Daughter of St. Mark--to become a ruling monarch? The union was engineered by her father Cav. Marco Cornaro and his younger brother Proc. Andrea Cornaro, two of the most ingenious men in the illustrious history of the Cornaro family and of Venice itself. In breath-taking fashion the event culminated more than 100 years of influence by the Cornaro family in the affairs of Cyprus. The story began in 1366 while Caterina's great-great-grandfather, another Marco Cornaro, was Doge of Venice. The then King of Cyprus made a tour through European capitals seeking money and allies to defend his kingdom against the imminent threat of invasion by the Ottoman Turks. His royal hosts through Northern Europe welcomed their fellow monarch but tendered no useful aide. In Venice, however, Doge Marco Cornaro's vastly wealthy cousin Federico Cornaro hosted the King's stay at his Cornaro palace on the Grand Canal. The Cornaros, led in the venture by Federico, provided privately the bulk of the financial resources that the King needed and that the royal houses of Europe had not dared to advance. Their support brought the Cornaros the rich plantations lying on the Episcopi peninsula along Cyprus' south coast and inaugurated a long and close relationship between the Cornaro and Lusignan families. In the 1460s Marco Cornaro, great-grandson of the Doge of the same name, together with his brother Andrea, established a lucrative trade between Venice and Cyprus. Andrea managed the family's affairs in Cyprus and Marco in Venice. As a civil war erupted between a daughter of the deceased King and her illegitimate half-brother, the Lusignans again turned to the Cornaro family for massive financial support. Andrea Cornaro became an indispensable advisor to James Lusignan, the half-brother. When he had successfully seized the throne as James II, the Cornaros--supported by the Venetian government--claimed their audacious prize: the marriage of James II and Marco Cornaro's young daughter Caterina. In fact, Caterina was actually of royal descent herself; her mother--Marco Cornaro's wife--was a granddaughter of the Emperor of Trebizond and therefore a descendant of the Emperors of the Byzantine Empire. The Cornaros presciently extracted an agreement that Caterina was to be not simply Royal Consort but ruling Queen--with full rights of succession. Or perhaps it was not prescience, but planning: some have suggested that the King did not die of natural causes. Caterina was to discover, like her husband before her, that the eastern Mediterranean was a difficult place for holding onto a crown.